This is what drives the age-associated decline in tissue function and the onset of age-related diseases such as cancer. The loss of stem cells is thought to be predominantly driven by accumulative damage to the DNA of stem cells. However, the source of this DNA damage in stem cells has previously been unclear. In a study just published in the journal Nature, scientists at the Deutsches Krebsforschungszentrum (DKFZ) Heidelberg and at the Institute for Stem Cell Technology and Experimental Medicine (HI-STEM gGmbH) have uncovered that environmental stress is a major factor in driving DNA damage in adult hematopoietic stem cells. Repeated exposure to such stress causes accelerated tissue aging and probably cancer. In addition, the study goes on to examine how this stress response impacts on a mouse model of a rare inherited premature aging disorder that is caused by a defect in DNA repair. Patients with Fanconi anemia suffer a collapse of their blood system and have an extremely high risk of developing cancer. 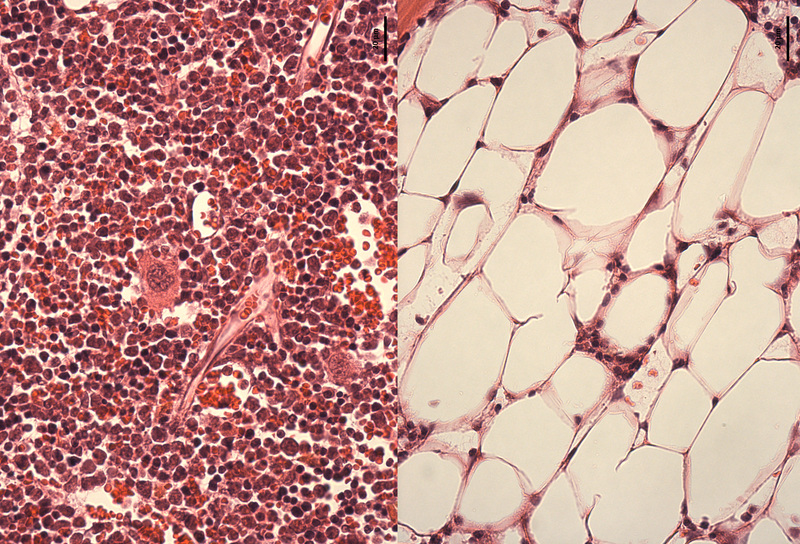 Mouse models of Fanconi anemia have exactly the same DNA repair defect as found in human patients but the mice never spontaneously develop the bone marrow failure observed in nearly all patients. “We felt that stress induced DNA damage was the missing ingredient that was required to cause hematopoietic stem cell depletion in these mice,” says Milsom. When Fanconi anemia mice were exposed to stimulation mimicking a prolonged viral infection, they were unable to efficiently repair the resulting DNA damage and their stem cells failed. In the same space of time that normal mice showed a gradual decline in hematopoietic stem cell numbers, the stem cells in Fanconi anemia mice were almost completely depleted, resulting in bone marrow failure and an inadequate production of blood cells to sustain life. “This perfectly recapitulates what happens to Fanconi anemia patients and now gives us an opportunity to understand how this disease works and how we might better treat it,” commented Milsom. 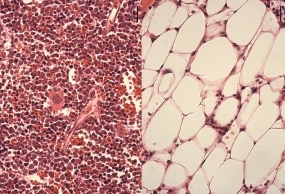 Caption: After waking up the hematopoietic stem cells, bone marrow of normal mice (left) is packed with blood cells whereas the bone marrow of Fanconi mice is severely depleted, the blood cells have been replaced by fat cells.